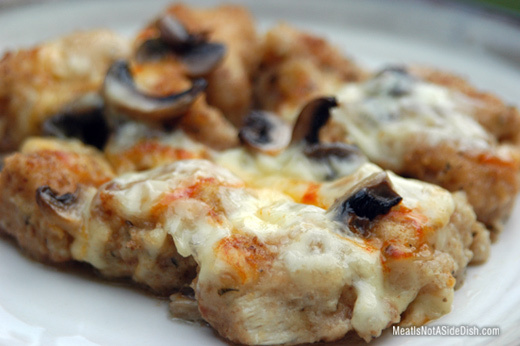 To make this Italian Chicken recipe, cut chicken into 1”x2” pieces and let stand in egg for one hour. Heat oil in skillet. Assemble breadcrumb mix and put in a large gallon Ziploc bag. Add chicken pieces to bag and shake to cover. Brown chicken pieces in oil. Chicken will not be fully cooked. 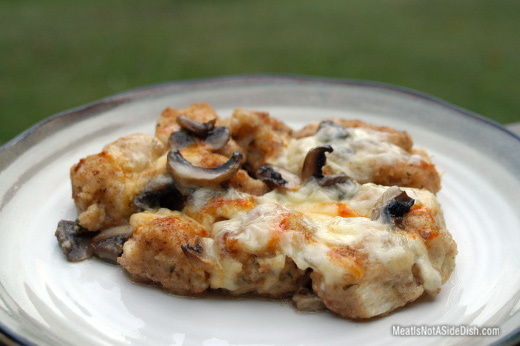 Place chicken in sprayed casserole dish (9×9 or smaller) large enough to allow for a single layer of chicken. Pour broth over chicken and cover with mushrooms and cheese. Cover loosely with aluminum foil and back for 30 minutes or until hot and bubbly. Remove foil for final 3-5 minutes to fully melt cheese.